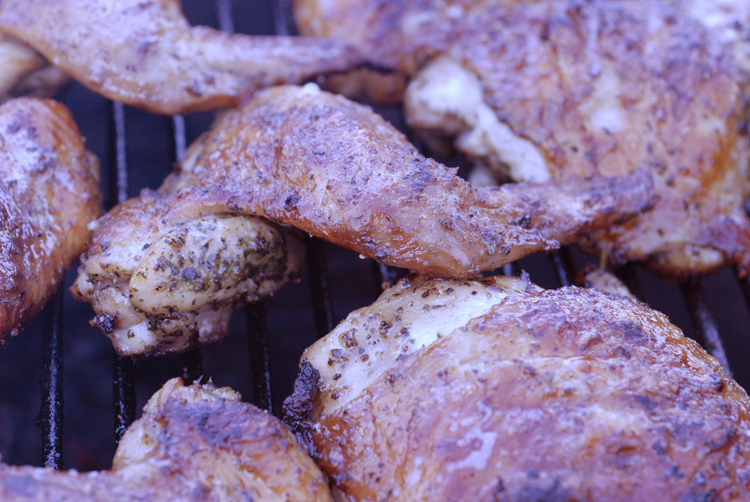 This is the best grilled chicken we’ve enjoyed in a very long time. The recipe comes from a popular restaurant in Pennsylvania called JohnJJeffries and was recently posted in the Epicurious RSS. This flavorful dish is brined, marinated and served with a chimichurri sauce. The process is a little lengthy, but worth it. Allow for 1 hour brining and 4 hours marinating. Put all the ingredients in a processor and puree until smooth. Add salt and pepper to taste. Cover and refrigerate. Boil 2 cups of water with pickling spices and 1/4 cup of fine sea salt in a large pot. Stir and heat through until salt has dissolved. Let cool on stove top. Add 6 cups water and honey stirring until combined. Place chicken pieces in pot and let brine for an hour. Meanwhile mix 1/2 cup olive oil, shallot, basil, parsley, rosemary, thyme and garlic in a processor until finely chopped. Place herb mixture in a 13x9x2 inch glass dish. Rinse chicken in cold water, pat dry and place in herb mixture. Turn all the pieces coating all sides. Cover and refrigerate for 4 hours or more. Prepare barbecue for medium heat. Remove excess marinade from chicken pieces and place on a baking sheet. Salt and pepper all sides. Grill the chicken covered until cooked through turning about every 30 minutes. Watch for flare-ups! Move the chicken to cooler locals if necessary. Alternatively, pre-heat oven to 325°. Bake chicken for an hour and 40 minutes or until a thermometer reads 165F. Serve with the chimichurri sauce. This version comes from the September issue of Food Network magazine. 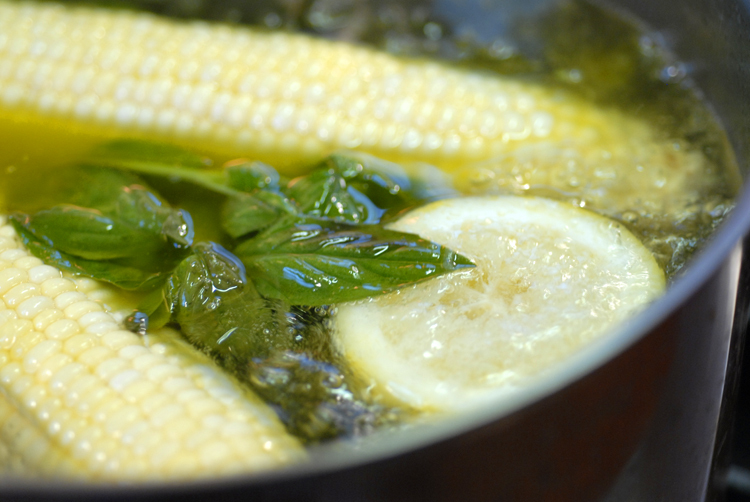 We excluded the flavored oil side, because we think the water the corn cooks in is flavorful enough. Bring 4 cups water, basil, lemon, oil and a pinch of salt to a boil. Carefully add corn and cook until just tender, about 5 minutes. Drain and enjoy! This salad is from Ina Garten with only a few tweaks. The dressing is very creamy and a little goes a long way, however it tastes very herbaceous and light because of the citrus, basil and tarragon. You will likely have far more dressing than required to dress your salads, but it also works well with baja fish taco, salmon sandwich or fajita, tartar sauce substitute and countless other applications. Place the first 9 ingredients in a food processor and mix until smooth. Add sour cream and blend briefly. Serve with tomatoes and lettuce. 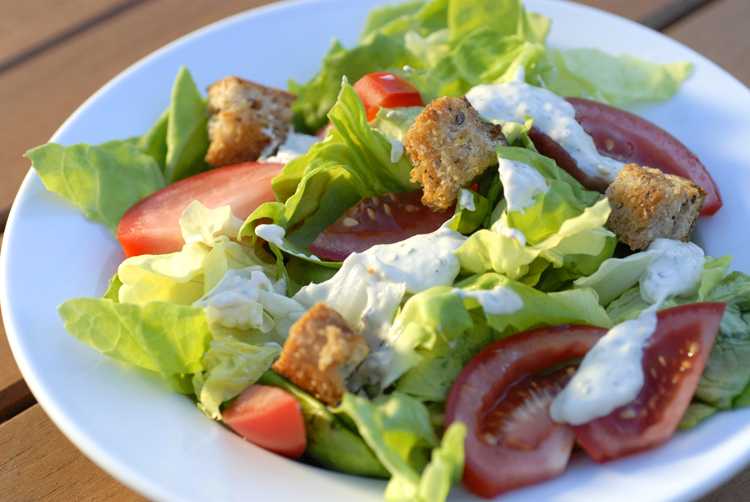 We found that fresh croutons added a much needed grounding for this very rich dressing so you may want to cube some bread up, toss it with some olive oil, salt and pepper and bake approximately 15 minutes at 350°. This entry was posted in entree, recipes, sides and tagged barbeque, chicken, salad by MixedSoup. Bookmark the permalink.